Western blot analysis of extracts from various cell types using TESK1 (D49D4) Rabbit mAb. 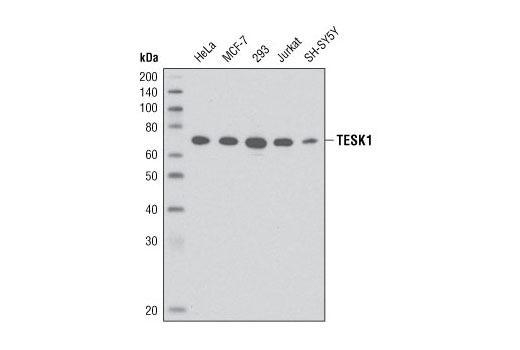 TESK1 (D49D4) Rabbit mAb detects endogenous levels of total TESK1 protein. Monoclonal antibody is produced by immunizing animals with a synthetic peptide corresponding to carboxy terminal residues of human TESK1 protein. Testis-specific kinase 1 (TESK1) is a LIMK-related protein kinase originally identified to be expressed highly in testes and subsequently shown to be expressed in a wide variety of tissues and cell types (1-4). TESK1 phosphorylates the actin severing protein cofilin at Ser3, inactivating cofilin and thus regulating the organization of the actin cytoskeleton (2). Integrin signaling activates TESK1 activity and leads to stress fiber formation and cell spreading (2,5,6). TESK1 is involved in regulation of ERK signaling through its interaction with Spry2 (7) and regulation of cell spreading through its interaction with the focal adhesion protein actopaxin/α-parvin (5). Toshima, J. et al. (1995) J Biol Chem 270, 31331-7. Toshima, J. et al. (2001) Mol Biol Cell 12, 1131-45. Toshima, J. et al. (2001) J Biol Chem 276, 31449-58. Toshima, J. et al. (2001) Biochem Biophys Res Commun 286, 566-73. Tsumura, Y. et al. (2005) Biochem J 387, 627-37. Chandramouli, S. et al. (2008) J Biol Chem 283, 1679-91.